Download "Company A EU Legal Entity Company A Only Representat. Customer. Supply polymer preparation"
1 REACH Registration of s in s Executive Summary Article 6.3 of REACH states that any manufacturer or importer of a polymer shall submit a registration to the Agency for the monomer substance(s) or any other substance(s) that have not already been registered by an actor in the supply chain. The information collated must include tonnages greater than 1tpa and details of customers and uses. This allows for a polymer importer to refer to the registration by their suppliers. In the case on non- manufactured monomers this may be via the appointment of an Only Representative (OR). Fischer (1), commissioned by the VCI, provides the legal opinion on this process, concluding that the obligations can be met by appointment of an OR to complete the registration process and the nomination of Trustees to maintain records of Downstream Users and volumes imported into Europe. 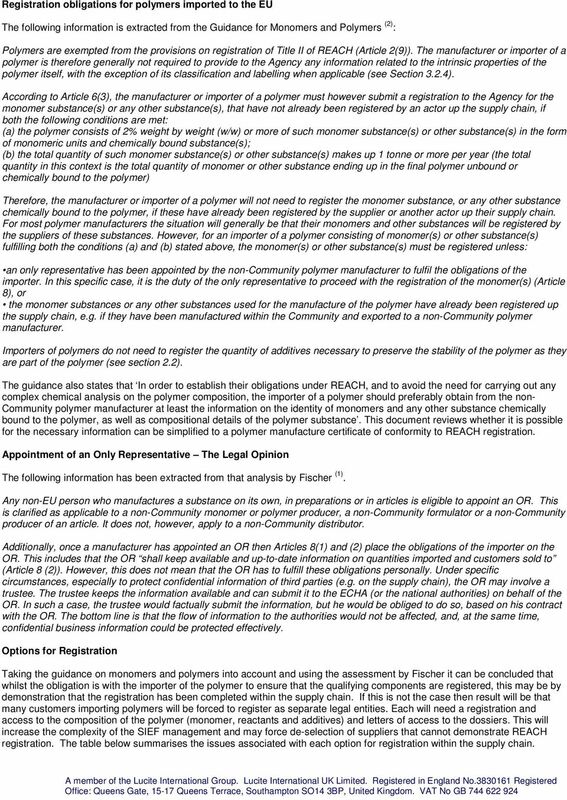 This assessment reviews the practicality of this approach against the other options for registration, concluding that individual registrations should be made by the substance manufacturers but that the responsibility for compiling the information to confirm the polymer volume supplied to the is fully compliant with REACH should be taken by the polymer manufacturer. 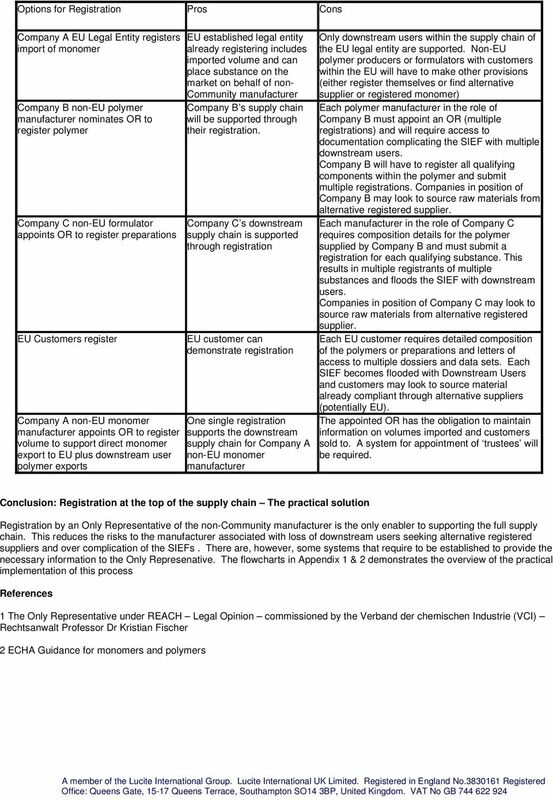 Registration of s within the Supply Chain Non Legal Entity Only Representat Supply monomer Company B or Formulator Supply polymer preparation There are 3 options as to who registers: The customers importing the polymer The non- manufacturer of the polymer (company B) The non- manufacturer of the monomer (company A) Any of these options is acceptable under the regulation. However, some have significant downsides and these are assessed within this document. This assessment requires and understanding of the obligations for registration of polymers imported to the. 2 Registration obligations for polymers imported to the The following information is extracted from the Guidance for s and s (2) : s are exempted from the provisions on registration of Title II of REACH (Article 2(9)). The manufacturer or importer of a polymer is therefore generally not required to provide to the Agency any information related to the intrinsic properties of the polymer itself, with the exception of its classification and labelling when applicable (see Section 3.2.4). 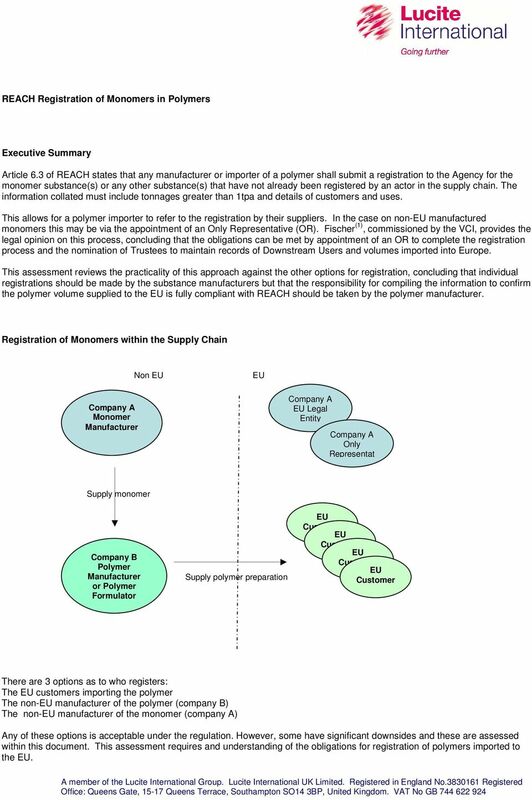 According to Article 6(3), the manufacturer or importer of a polymer must however submit a registration to the Agency for the monomer substance(s) or any other substance(s), that have not already been registered by an actor up the supply chain, if both the following conditions are met: (a) the polymer consists of 2% weight by weight (w/w) or more of such monomer substance(s) or other substance(s) in the form of monomeric units and chemically bound substance(s); (b) the total quantity of such monomer substance(s) or other substance(s) makes up 1 tonne or more per year (the total quantity in this context is the total quantity of monomer or other substance ending up in the final polymer unbound or chemically bound to the polymer) Therefore, the manufacturer or importer of a polymer will not need to register the monomer substance, or any other substance chemically bound to the polymer, if these have already been registered by the supplier or another actor up their supply chain. For most polymer manufacturers the situation will generally be that their monomers and other substances will be registered by the suppliers of these substances. 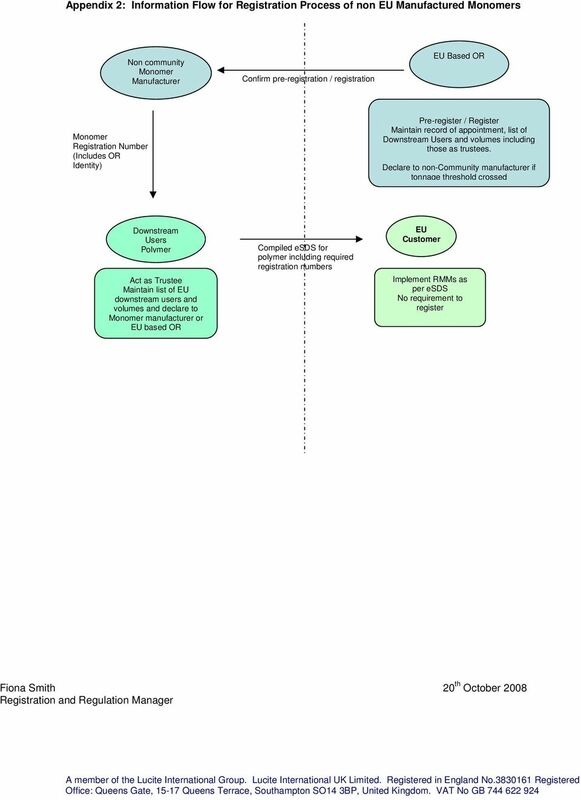 However, for an importer of a polymer consisting of monomer(s) or other substance(s) fulfilling both the conditions (a) and (b) stated above, the monomer(s) or other substance(s) must be registered unless: an only representative has been appointed by the non-community polymer manufacturer to fulfil the obligations of the importer. In this specific case, it is the duty of the only representative to proceed with the registration of the monomer(s) (Article 8), or the monomer substances or any other substances used for the manufacture of the polymer have already been registered up the supply chain, e.g. if they have been manufactured within the Community and exported to a non-community polymer manufacturer. Importers of polymers do not need to register the quantity of additives necessary to preserve the stability of the polymer as they are part of the polymer (see section 2.2). The guidance also states that In order to establish their obligations under REACH, and to avoid the need for carrying out any complex chemical analysis on the polymer composition, the importer of a polymer should preferably obtain from the non- Community polymer manufacturer at least the information on the identity of monomers and any other substance chemically bound to the polymer, as well as compositional details of the polymer substance. This document reviews whether it is possible for the necessary information can be simplified to a polymer manufacture certificate of conformity to REACH registration. Appointment of an Only Representative The Legal Opinion The following information has been extracted from that analysis by Fischer (1). Any non- person who manufactures a substance on its own, in preparations or in articles is eligible to appoint an OR. This is clarified as applicable to a non-community monomer or polymer producer, a non-community formulator or a non-community producer of an article. It does not, however, apply to a non-community distributor. Additionally, once a manufacturer has appointed an OR then Articles 8(1) and (2) place the obligations of the importer on the OR. This includes that the OR shall keep available and up-to-date information on quantities imported and customers sold to (Article 8 (2)). However, this does not mean that the OR has to fulfill these obligations personally. Under specific circumstances, especially to protect confidential information of third parties (e.g. on the supply chain), the OR may involve a trustee. The trustee keeps the information available and can submit it to the ECHA (or the national authorities) on behalf of the OR. In such a case, the trustee would factually submit the information, but he would be obliged to do so, based on his contract with the OR. The bottom line is that the flow of information to the authorities would not be affected, and, at the same time, confidential business information could be protected effectively. Options for Registration Taking the guidance on monomers and polymers into account and using the assessment by Fischer it can be concluded that whilst the obligation is with the importer of the polymer to ensure that the qualifying components are registered, this may be by demonstration that the registration has been completed within the supply chain. If this is not the case then result will be that many customers importing polymers will be forced to register as separate legal entities. Each will need a registration and access to the composition of the polymer (monomer, reactants and additives) and letters of access to the dossiers. This will increase the complexity of the SIEF management and may force de-selection of suppliers that cannot demonstrate REACH registration. 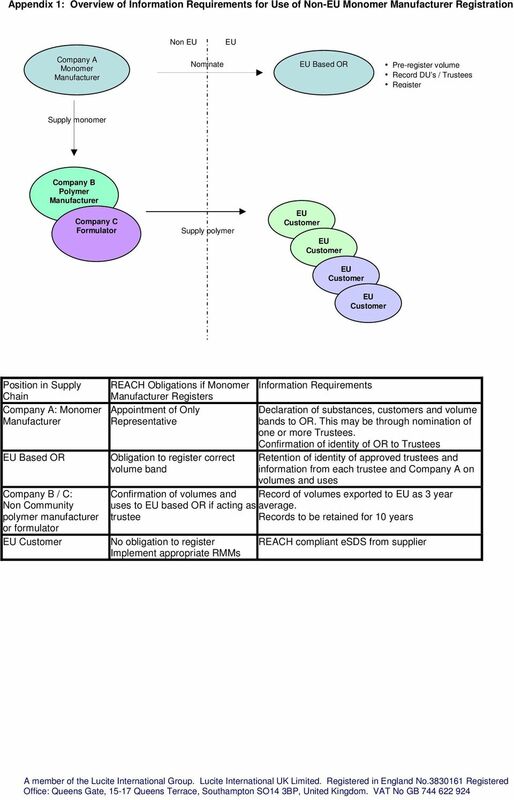 The table below summarises the issues associated with each option for registration within the supply chain.